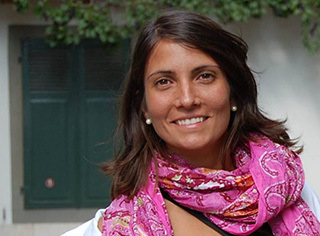 Sustainable textiles – a major issue in fashion for some time now. 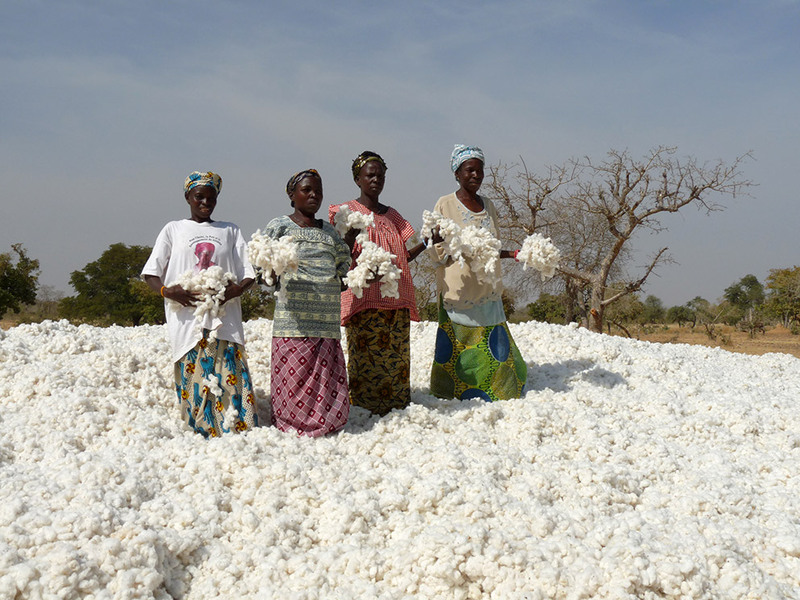 The proportion of total global cotton output accounted for by organic cotton is still a mere 1 percent, but in recent years there has been immense growth, as the business with textiles produced in an ecofriendly and socially responsible manner is rocketing. Organic cotton is now being cultivated in no less than 24 countries, including Turkey, India, China, Syria, Peru and the United States. Alongside more conventional eco-fashion houses such as HessNatur, the largest buyers are above all the chain stores, such as H&M, C&A and Zara. And organic cotton has even made inroads into “haute couture”: Stella McCartney uses it, as do labels such as Noir or Edun, founded by U2 singer Bono. In October 2014 members of civil society, standards organizations, the trade unions and businesspeople joined forces in Berlin to found the Partnership for Sustainable Textiles. Together they want to improve the social, ecological and economic conditions of the global supply chains in the textiles and clothing industry. And Messe Frankfurt is organizing special sub-sector trade fairs, such as the “Ethical Fashion Show” and the “Green Showroom” as part of Berlin’s Fashion Week – “green” is the theme. And if something promises to be a success, then it swiftly gets transferred to other fields, too. The topic of sustainability is thus also becoming increasingly important for home textiles. Ikea, for example, recently announced that in future it would only use cotton that has been sustainably farmed for its textile products. Heimtextil has been presenting all those companies offering sustainable home and contract textiles using a “Green Directory” guidance system since back in 2011 and is also hosting corresponding lectures, “green” tours, additional information zones at the trade fair (called the “Green Village”) and organizing the “Young Creations Award: Upcycling” for new talent. 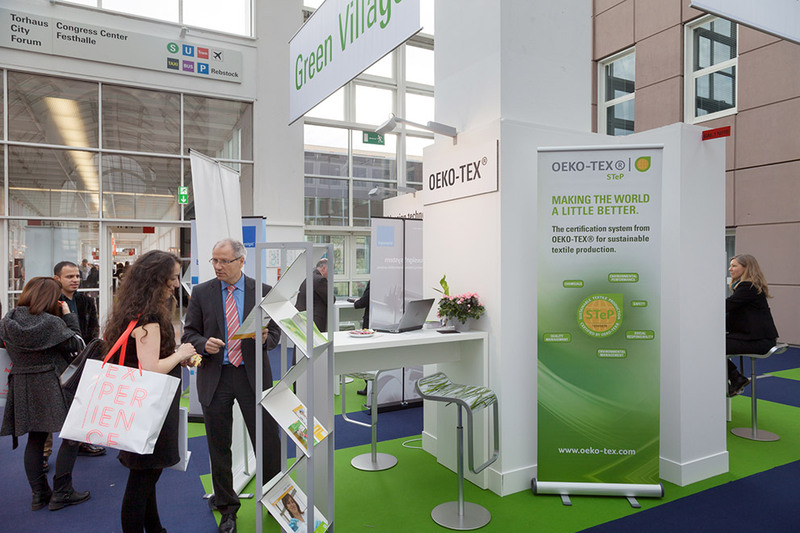 To provide even better guidance, the “Green Directory” now features three eco-signets that inform visitors about the key focal themes in a company’s sustainability portfolio in an easy-to-use printed or digital guide; these will also be displayed on the respective trade-fair booths. The “green leaf” will stand for ecofriendly materials, the “blue leaf” for ecofriendly processes, and the “brown leaf” for sustainable social standards and transparency. These trade-fair signets should not be confused with international quality seals, such as BSCI, Fairtrade, GOTS or the OEKO-TEX certification system (turn to the end of the article to find out more). In Hall 4.1 it is well worth visiting the Dutch corporation Raymakers, Royal Dutch Textile Mills (booth G41). In recent decades the company has concentrated first and foremost on developing and manufacturing so-called pile fabrics, in particular velvet. Be it uni-colored or patterned and with various different qualities available, Raymakers’ high technological weaving standards and the outstanding finishing have made it one of the leading makers of velvet for curtains and upholstery. There are two wallpaper manufacturers in Hall 3.1 well worth visiting, the one from the United States, the other from Great Britain: Brewster Home Fashions (booth C11) and Muraspec Decorative (booth E15). Brewster dominates the entire spectrum of wall design products, offering a complete array of vintage motifs, floral prints, and modern designs. The Americans themselves call their “grasscloth” wallpapers “eco-chic” – the products are made of ramie, a plant from the nettle family. 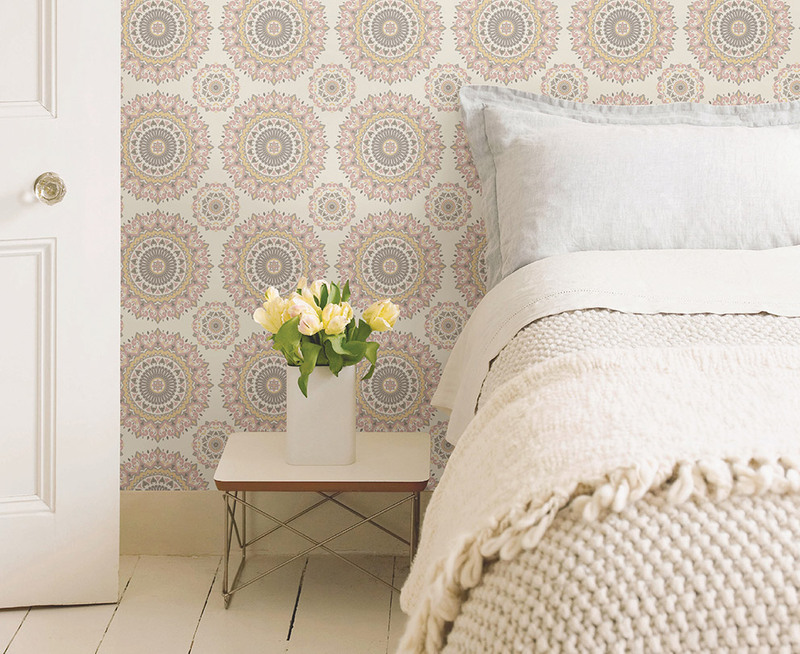 Muraspec stands for wallpaper variants that are primarily used in the contract market. They are made of the broadest range of different materials, including versions with a woven laminate, or made of paper or textile. In 2012, the Muraspec wallpapers were the very first to be awarded so-called eco-points by BRE Global (Building Research Establishment); the emphasis there is on eco-specific product declarations and the carbon footprint. Each year, Wellman International recycles about 2.2 billion PET bottles. The Irish company, which displays its products in Hall 3.0 (booth VIA03), is specialized in manufacturing the fibers from which home textiles can be made that are suitable for allergy sufferers. The Dibella Group, based in Bocholt, is located in Hall 8.0 (booth D83). 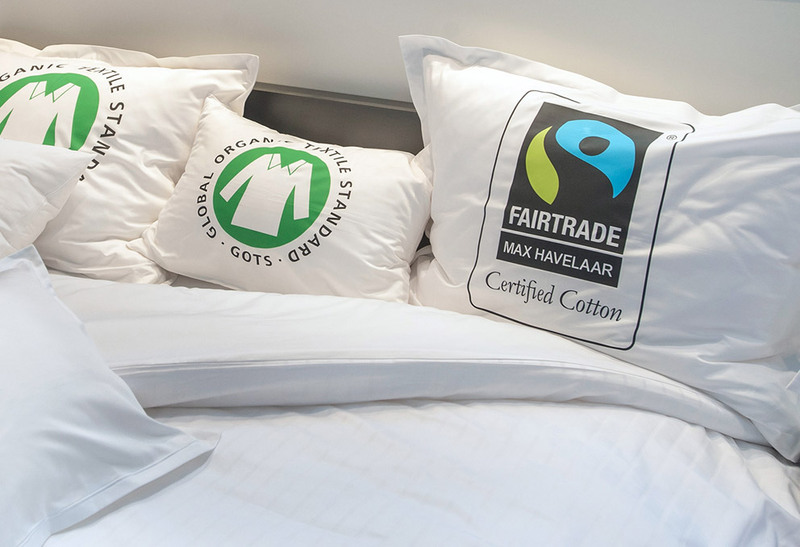 It supplies hotels with GOTS and Fairtrade®-certified bed linen, tablecloths and towels and has set itself the objective of being able to use its textiles to create “green hotel rooms”. The Lenzing Group from Austria is likewise to be found in Hall 8.0 (booth H65) and supplies the world’s textile and wovens makers with high-grade industrially manufactured cellulose fibers, ranging from classic viscose to modal fibers to Tencel, which is Lyocell fiber. In Hall 10.2, Bangladesh’s ACS Textiles and Towel (booth A01) presents an array of satin bed linen as well as towels made from Egyptian organic cotton. As a wholly owned subsidiary of a British company, ACS offers the ultimate state-of-the-art production facilities for weaving, dying, printing and refining, all of them certified according to ISO 9001. Likewise in Hall 10.2, Pakistan’s Sadaqat Limited (booth A61) is exhibiting its “filled” textile products (such as duvets, pillows and decorative cushions) and its “unfilled” lines (sheets, bed covers and pillowcases) as well as shower curtains, bathroom and kitchen accessories, all of them certified in line with a variety of sustainability labels. Visitors to the trade fair can find out all about all sorts of things relating to sustainability at the “Young Creations Award: Upcycling” exhibition for new talent and at the “Green Village” center of excellence, where they can discuss the latest trends with certifiers and the bodies awarding quality seals. And the “Green Tour” takes visitors around companies that stand out for their sustainable business models. The tours start on Wednesday and Thursday at 3 p.m. respectively in Hall 8.0; the lectures at the “Green Village” will be held on Wednesday and Thursday afternoon. is an initiative launched by Brussel’s Foreign Trade Association (FTA). At present, over 1,300 member companies have signed up to it in an effort to assess and improve social compliance in their global supply chains. Here the focus is on combating poverty and strengthening environmental protection in Africa. Special training sessions are held for smallholders teaching them how to produce cotton efficiently and in an ecofriendly way – and then sell it at world market prices. With the “CmiA” seal companies can demonstrate their commitment to sustainability. Products from Fairtrade-certified cotton receive the “Fairtrade Certified Cotton” quality seal. A fixed minimum price, a Fairtrade premium, as well as eco-criteria are destined to improve the living and working conditions of smallholders and their families. Supply-chain companies must prove that they adhere to the ILO core labor standards. In 1998, the International Labor Organization (ILO) resolved social standards in the framework of the world trade order. is an internationally recognized standard for the processing of certified organically grown natural fibers. Environmental and social criteria play equal roles in the overall textile production chain. Quality assurance is guaranteed by independent certification. “Sustainable textile production” or STeP for short is the new OEKO-TEX certification system for brands, retailers and manufacturers of textiles that wish to communicate their achievements in the field of production conditions in a transparent, credible and comprehensible way. Made in Green by OEKO-TEX is a tracking label and is issued not only for clothing but for other textile articles, too, that combine the non-toxicity of OEKO-TEX® Standard 100 with demonstrably ecologically optimized and socially responsible production conditions. By means of a control number on the “Made in Green” label, every product can be tracked, so you know where and how it was made. The label is awarded by the Internationale Gemeinschaft für Forschung und Prüfung auf dem Gebiet der Textilökologie. “Das Stue” Hotel in Berlin boasts a colorful and varied interior. Uta Abendroth talked to Eugenia Linares of LVG Arquitectura, which designed “Das Stue”, on the role of textiles.